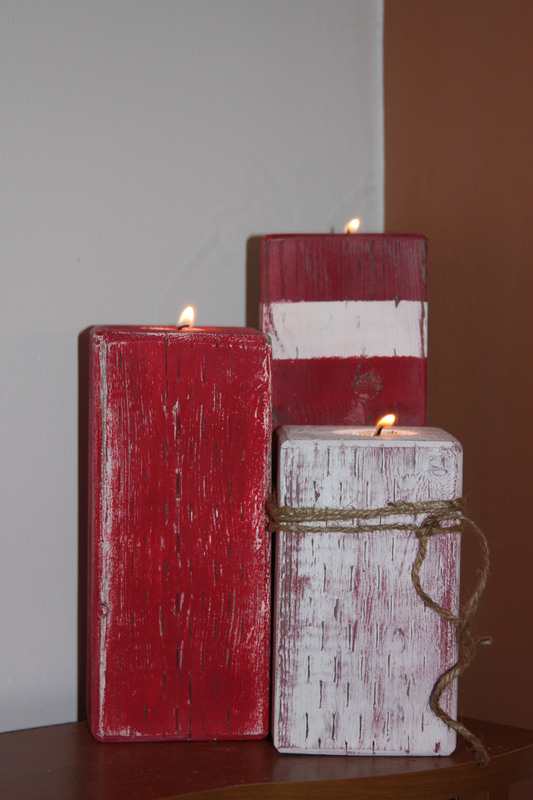 WELCOME TO DAY 10 OF MY 12 DAYS OF CHRISTMAS DECORATING, CRAFT AND GIFT IDEA CHALLENGE. We had a temporary “get us through the winter safely” fix up on our front door step recently and I was so excited when I discovered there was left over 4×4 lumber. 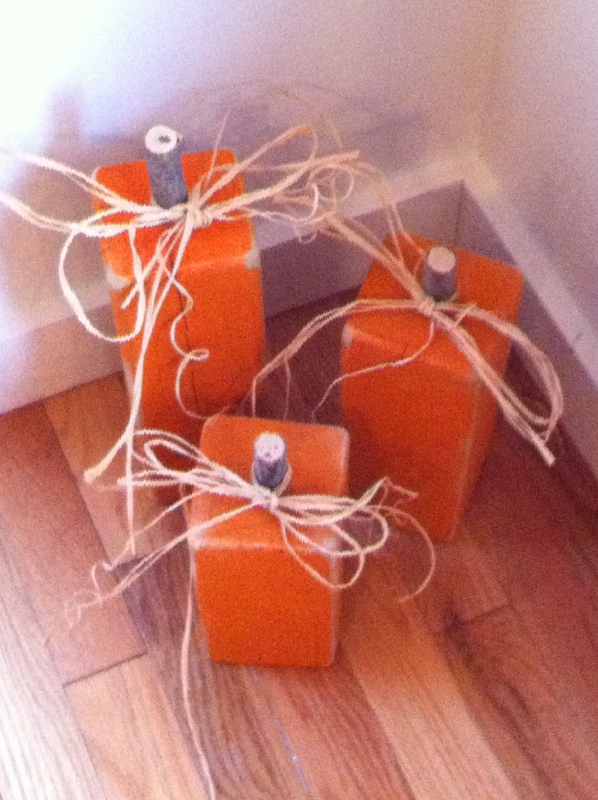 So, just like back in October re the wooden pumpkins I made with the pieces of 4×4 that L cut for me. Shown here… I had L do the same thing with the leftover 4×4 from the front door fix. He cut and sanded for me 1 x 6″ high, 1 x 8″ high and 1 x 10″ high, only this time he drilled a hole in the middle on top using a 1 3/4″ spade bit for a tea light candle. I couldn’t really decide what colors I wanted so I went to my paint stash and let what I had on hand determine what colors they would be. As you can see I went with red and white. I first painted the smallest one (6″) red, the 8″ one white and the 10″ one red. I did this so that when I sanded the corners the bottom color would show through for a more weathered and worn look. L commented that the red and white one looked like a lighthouse and ya know I’m kinda OK with that considering I am from the East Coast of Canada!! Sooooo, I figure I can use these all year round, not just at Christmas……I can already see them on the patio, perhaps the lighthouse one will light my way some foggy night safely back into the house LOL. All in all it’s A Wandaful Thing!!! 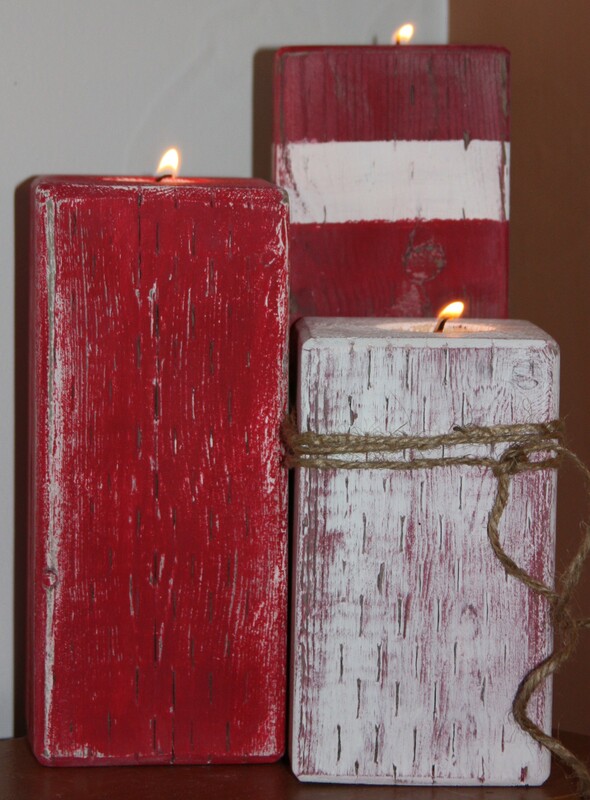 This entry was posted in Decorate, DIY and tagged 4x4, candle, Challenges, Christmas, Crafts, crafts, Decorate, DIY, easy, lighthouse, paint, patio, pumpkin, tealight, wood. Bookmark the permalink.